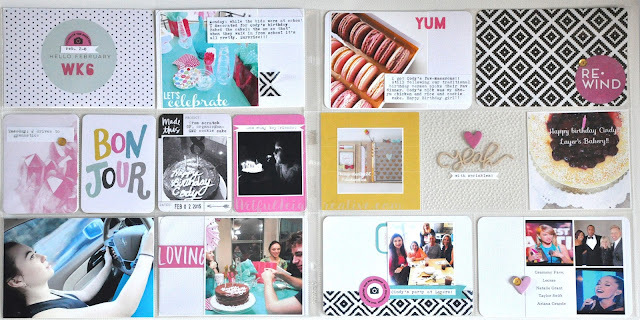 Sharing week six using the Studio Calico Monthly Project Life kit called Cirque, and it's a beauty!! Nice pink, aqua, and yellow cards this month. Week 6: left side Design A Becky Higgins LLC. page protector, right side Design Q Becky Higgins LLC. page protector with 3 4x4 pockets in the center. Right page uses the Studio Calico Ringmaster add-on, that came with that gorge tribal washi, 4x4 transparent cards ( middle ) and laser cut wood veneer words "yeah, hustle, and February" and much more. Love it! The top right 4x6 card is from the Heidi Swapp "Favorite Things" Project Life Core Kit, with one gold sequin from the SC kit. The first yellow 4x4 card on the left of the right page is simply the SC kit title card, and I covered up the words in the center with a photo, quick and easy. Thanks for visiting and happy documenting!